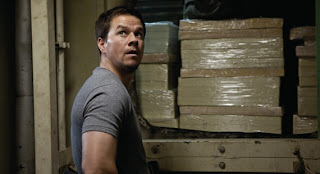 There’s not a whole lot in Contraband, the new heist thriller starring Mark Wahlberg, you haven’t seen done better elsewhere. This is another one of those B-movie plots about a former criminal being forced, through unpleasant circumstances, to abandon peaceful retirement and take on One. Last. Job. You know the type of job I’m talking about: a final convoluted journey into the seedy underworld where everything that can go wrong does so spectacularly, every pre-established rule is broken and yet, somehow, the hero manages to emerge triumphant and mislead the sinister antagonist, as well as the audience. It’s a fun, seemingly inexhaustible, formula, and one that can very easily become repetitive and tediously predictable. However, Icelandic director Baltasar Kormákur has managed to imbue his Americanized remake of 2008’s little-seen Reykjavik-Rotterdam – which was helmed by Óskar Jónasson and featured Kormákur in the lead role — with just enough grungy off-beat charm to warrant its own rather slight existence. 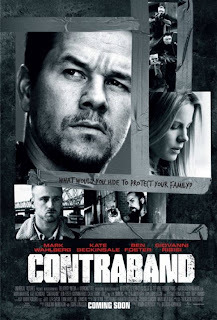 Contraband is the kind of movie you unintentionally come across on TV one night and, after a reasonably engaging two hours, find yourself reflecting on why you have no memory of it ever being in theatres. Wahlberg treads familiar thespian terrain as Chris Farraday, a soft-spoken working class New Orleans family man with a mean right hook and a gift for smuggling. How good a smuggler is Chris? So good that other characters often feel compelled to remind him of his top-notch credentials. Like every other heist movie hero, Chris is the best there is at what he does. Unfortunately for him, his specialized services are desperately required after his ne’er-do-well brother-in-law Andy (Caleb Landry Jones) botches a drug operation and infuriates local crime lord Tim Briggs (Giovanni Ribisi). Soon, thugs are threatening the Farradays’ safety, and Chris is tasked with transporting millions of dollars worth of counterfeit cash from Panama to U.S. shores. Aided by his recovering alcoholic right-hand man Sebastian Abney (Ben Foster), our crafty, muscular protagonist books passage on a dingy cargo ship on a perilous mission to outsmart the ever-vigilant authorities and make it home alive with merchandise in hand. One of Kormákur’s film’s most endearing qualities is how refreshingly low-tech it is. 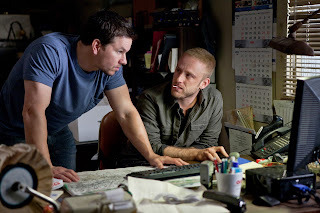 Unlike most modern heist pictures, which typically involve high-pressure internet surfing and goofy gadgets,Contraband – like Ben Affleck’s superior The Town – wears its blue collar attitude like a badge of honour. Outside of some brief ship manifest doctoring, Chris has little use for computers, relying instead on mundane, practical methods for deceiving the powers that be. He succeeds not because he has more gear or brains than his opponents, but rather due to the fact that he’s adept at improvisation and sizing up a situation, and never underestimates the importance of dumb luck. Or grade 8 science. The scrappy street-smart tone of the picture also inspires three wonderfully weird performances that breathe much-needed life into the conventional story. Chief among them is Ribisi as the lowly scumbag drug kingpin. Repulsively greased up, python-voiced and operating out of a pathetic ramshackle apartment complex, the actor creates a fascinating case study in terrifying incompetence. No matter how badly Farraday beats Briggs down, he just keeps picking himself up and continuing the pursuit like a possessed cockroach. Ribisi’s sole competition in the scenery-chewing department is Diego Luna, playing a deranged, agitated Panamanian gangster whose sweaty psychotic unpredictability more than makes up for his lack of physical fearsomeness. On the lower end of the crazy-scale is Ben Foster — an eminently watchable beacon of offbeat light in any movie — who doesn’t necessarily have a lot to do here, but adds impressive anguished, twitchy dimension to the ever-rattled Sebastian. 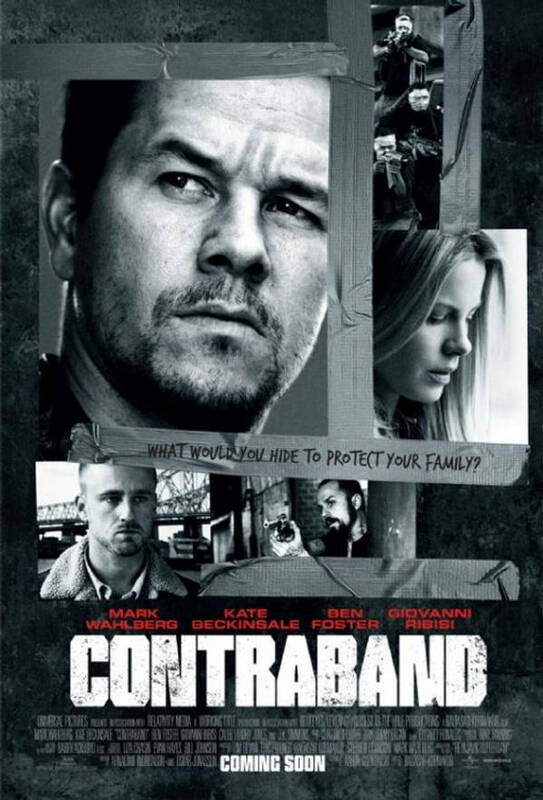 Contraband’s unremarkable script, by Aaron Guzikowski, hums along nicely when it’s tracing our hero’s journey through the movie’s criminal universe. It stumbles awkwardly, however, whenever the action shifts back home to Chris’s wife Kate (Kate Beckinsale). The actress has alarmingly little to do, beyond acting frantic and having her beautiful head slammed into walls by vicious aggressors, and the picture completely deflates once she becomes a key element in the climax (Hallelujah for conveniently loud ring tones!). A more effective film would have either excised the majority of her subplot, or brought more originality to it than hackneyed, eye-rolling “woman in peril” clichés. It is a telling sign that this film has been released in sleepy mid-January, when studios traditionally refrain from pushing exciting A-grade fare into theatres. Neither particularly good, or bad, it’s an agreeable enough timewaster that won’t tax your patience and serves as a modestly tense and satisfying tide over until 2012’s more ambitious popcorn fare arrives. Like Wahlberg’s world-weary protagonist, Contraband gets the job done with minimal flash or flare. hi guys! if you want to buy men leather jackets at affordable price with quality in material & Stitching, with free shipment on order $200.